Product prices and availability are accurate as of 2019-03-24 16:40:54 EDT and are subject to change. Any price and availability information displayed on http://www.amazon.com/ at the time of purchase will apply to the purchase of this product. 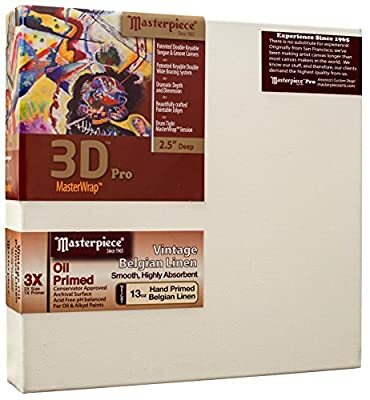 Masterpiece 3D Pro 2-1/2" Deep Artist Canvas. Pure medium weight Belgian Linen finished to a primed weight of 13 oz. per square yard. It's sized and single primed with archival quality oil primer, making the ground impervious to paints leaching through and harming the fabric. For oil or alkyd paints only. It is highly absorbent and has excellent qualities of luminosity. It has a warm yellowish hue and is very popular among oil painters..it's a fabulous painting surface! Belgian linen is very strong and has natural oils within it's fibers which keep it flexible and help prevent disintegration over time. The surface has a smooth tooth, although not considered of a portrait texture. With respect to frame construction, a celebrated feature of this product is what is called ''Canvas Relief'', which is the space between the canvas and the Stretcher Bar. There is 1/2'' of relief making it virtually impossible press on the canvas and touch the stretcher bar underneath. The frame is made from solid pine or fir wood harvested from the sustainable forests of the Pacific Northwest. 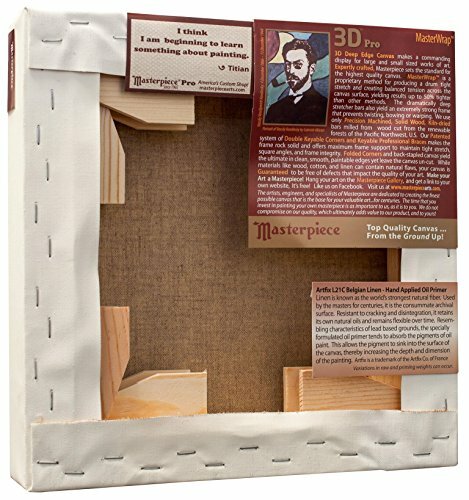 Finger joints are never used in Masterpiece's wood frames. They are known to fail under pressure and over time, the glue joints break down, and are generally unsuitable for canvas frames that intended to last for centuries under continual tension. Precision machined double tongue-and-groove corners allow you to increase the canvas tension. A double wide brace is included. The Stretcher Bars are slotted in the inside perimeter of the frame to accept cross braces. Patented keyable cross braces make it possible to tension the canvas in the middle of the frame, where it's needed the most! Both corner keys and brace keys are pre-installed. Stretched using our proprietary MuseumWrap stretching method, which means that the canvas is stretched drum-tight, up to 50% tighter than other methods, and with balanced tension across the surface of the canvas. The corners are neatly folded, uncut, and perfectly intact, thereby making it possible for the canvas to be removed and restretched on the same size frame. The edges are suitable for painting for display with or without a frame. A free inspirational art quote refrigerator magnet is included. There are over 120 to choose from! Made in North America! Pure Belgian Linen, 12 oz finished weight. Naturally strong linen with a characteristic linen texture. Sized and double primed with archival quality acrylic gesso. Canvas Depth: 2-1/2", Canvas relief: 1/2" (Space between canvas and Bar). Solid Pine or Fir Stretcher Bars from the sustainable forests of the Pacific Northwest. No finger joints are allowed, which tend to fail under pressure and over time. Precision machined double tongue-and-groove corners allow you to increase the canvas tension. Double Wide Brace and Double Wide Cross Brace Included. Bars are slotted on the inside perimeter of the frame to accept cross braces. Patented Keyable Cross Braces allow you to add tension to the middle of the canvas, where it's needed the mostBoth corner keys and brace keys are pre-installed. Stretched using our MuseumWrap method yielding a balanced tension across the surface of the canvas, and a drum-tight stretch that is up to 50% tighter than other methods. Folded corners mean a canvas that is uncut and perfectly intact, allowing the canvas to be removed from the frame and re-stretched.